Xiamen is a city on the southeastern coast of China. It consists of Xiamen Island, Gulangyu Island and a region on the mainland. The city has a major seaport and is nearby Taiwan. It is considered as one of the most clean cities within China. 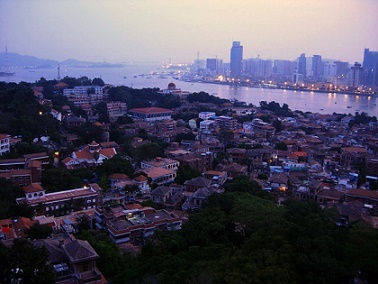 Gulangyu is the top attraction in Xiamen. It’s a beautiful island of 2 km2 with secluded valleys, rocks, sheer cliffs, reefs and sandy beaches. Gulangyu has about 20.000 residents and is on China’s list of National Scenic Spots. The island is a pedestrian zone and has a paved 4 kilometer ring road.A ferry takes visitors from Xiamen Island to Gulangyu Island in just 5 minutes. The Sunlight Rock is the highest point on Gulangyu Island (93 meter). Admission to the island is 90 Yuan including fees of roundtrip boat, Sunlight Rock and Shuzhuang Park. The Tourism Distribution Center is inside the long distance bus station at South Hubin Road. From this bus station there are buses running to four scenic places outside Xiamen City: Wild Valley Forest Park, Sanping, Qinglong Village and Changtai Drift. 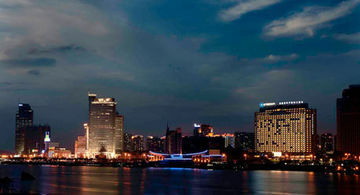 Xiamen is an important port city in China.